These posters are 11x17. Just choose the right size paper before printing. I laminated mine and added a magnetic sticker on the back. 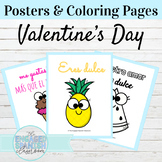 These posters include the following vocabulary: Poster 1: La ropa. I use this poster for clothing themes but also when taking about the weather and the calendar. 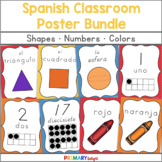 These are 12 posters of 12 essential phrases/questions in the Spanish classroom to get them speaking in the target language from day one! 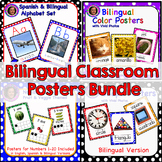 Inform and spice up your classroom with informative posters! 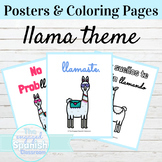 These 8 infographs include: a common helpful Spanish phrase, its translation in English, and a related picture. A great addition to any language learning atmosphere! 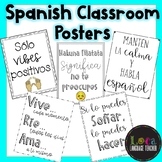 Three "Spanish Only" Classroom Posters -- English, No...Spanish, Yes! This is a fun way to relate to your students while encouraging them to be excited about your subject. 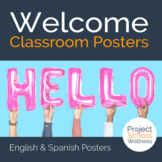 Welcome students into your classroom and let them know they belong with this classroom poster bundle! 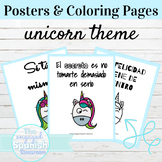 This bundle comes with: - - Six posters- - English only version of the posters- - English/Spanish version of the posters (as seen above)All you have to do is download and print on 11×17 paper! 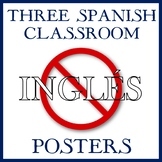 Have students ask in Spanish to leave the room.This sign posted above the door really helps!